Israeli forces attacked 18 targets in the Gaza Strip belonging to Hamas, which controls the besieged enclave, in the second such action over the weekend. The strikes followed an explosion during a demonstration of Palestinians on the southern border with Israel Saturday that injured four Israeli soldiers. The Israeli military shot and killed two Palestinian teenagers in response. It was the worst such border incident since Israel’s war against Gaza in 2014 and portends a broader offensive. None of the militant groups in Gaza has claimed responsibility for the explosion. Israeli Defence Minister Avigdor Lieberman accused the Popular Resistance Committees, one of the smaller armed groups in Gaza, of detonating the bomb. Nevertheless, as always Israel holds Hamas, the Islamist national bourgeois party that controls Gaza, responsible for the attack. 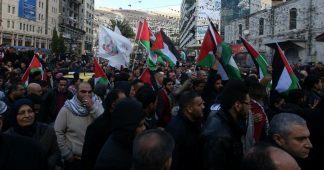 For months, there have been almost weekly demonstrations against Israel’s blockade of Gaza and the deteriorating economic conditions. Last December, tensions rose after US President Donald Trump recognised Jerusalem as Israel’s capital. Earlier this year, Gaza’s traders closed in protest over the deteriorating situation. Israel’s Army Chief of Staff Gadi Eisenkot warned the cabinet recently that tensions were rising due to the worsening humanitarian crisis, that demonstrations were increasing in size and that an incident along the fence could spark an escalation of hostilities. His purpose was to get cabinet approval for harsh measures to deal with the crisis in the face of Gaza’s economic collapse. Conditions in Gaza, a narrow coastal strip on the Egyptian-Israeli border, after 11 years of living under a land, sea and air blockade, are hellish. Last year, a United Nations report stated that the living conditions for two million Palestinians had deteriorated “further and faster” than the prediction made in 2012 that the enclave would become “unlivable” by 2020. Large numbers of people are destitute. Forty-six percent of the population are without work. Sixty five percent live on $1.90 or less a day. This collapse in purchasing power has led to a huge drop in the number of trucks entering Gaza with food and equipment—from 800-1,200 a day to just 300. Power shortages mean that most Palestinians are lucky if they get four hours of electricity a day. There is not enough power to pump sewage, so 95 percent of Gaza’s drinking water is not fit to drink. The coastal aquifer is almost unusable and will soon be irreversibly-depleted unless remedial action is taken. The health system is collapsing, medical supplies are dwindling and clinics are closing, causing untold suffering and unnecessary deaths. Unable to get treatment in Gaza for complicated or chronic medical problems, many seek treatment in Egypt, Israel, the West Bank or Jordan. Yet last year, Israel granted just 54 percent of 25,000 applications for travel permits in time for patients to attend their scheduled appointments, down from 92 percent in 2012. As a result, at least 54 people died in 2017 waiting for visas. Children are in school for just four hours a day. There is no escape from this open-air prison. Israel has surrounded the Gaza Strip with a high-tech barrier and spent almost $1 billion building an underground-barrier project to seal its border to the attack tunnels into Israel. It controls two of the three exit points, while Egypt controls the third. Last year, Israel issued one-third of the number of exit visas issued two years earlier and just one percent of the number in early 2000. Movement between the two Palestinian territories, Gaza and the West Bank, in either direction is all but impossible. The economic and social plight of the two million Palestinians living in the tiny enclave has been dire ever since Israel, with the full support of the US, European Union and the Fatah-controlled Palestinian Authority (PA)—particularly since 2013—imposed a blockade on Gaza. Jordan, by imposing strict transit conditions on Gazans, and Egypt, which controls the Rafah crossing, have played a key role in the siege. The siege of Gaza was mounted following the unexpected victory of Hamas over Fatah in the January 2006 elections which the major powers had intended as a means of strengthening the hand of Mahmoud Abbas, Fatah leader and PA President. Winning 44 percent of the vote in the West Bank and Gaza, compared to Fatah’s 41 percent, Hamas took 74 of the 132-seat Palestinian Legislative Council. Hamas’ election victory was the result of widespread disgust at Fatah’s corruption and subservience to Israel. The Oslo Accords, which Hamas had earlier opposed, had brought wealth for a few and unemployment, poverty and military oppression for the majority, while the Israeli settlements on land to be included in any future state had increased. Despite Hamas’ willingness to accept some form of a “two state solution” and take a minority role in a coalition with Fatah, Israel and the US rejected this. They demanded Hamas abandon its three core tenets and renounce the use of arms, recognise Israel and sign up to the Oslo Accords in return for international recognition of a Hamas-controlled PA, or face an international boycott. The other members of the Quartet, the UN, European Union and Russia, soon fell in line with Washington’s demands, and the EU too cut its aid to the PA. The US and Israel were determined to prevent any attempts by Fatah and Hamas to reach an agreement, deepening the split between the two factions in order to divide and rule, while increasing Hamas’ economic dependence on Qatar and Iran. In June 2006, Israel launched an attack on Gaza, knocking out its power station, making Gaza increasingly dependent on Israel for its electricity and precipitating daily power cuts lasting for hours at a time. Israel tightened its blockade on Gaza after Hamas forestalled and defeated an attempted coup by Fatah in a brief but brutal civil war in June 2007. Three military assaults on Gaza in 2008-09, 2012 and 2014 killed 1,417, 147 and 2,250 Palestinians respectively, and destroyed much of Gaza’s basic infrastructure together with tens of thousands of homes. Around 90,000 of the 500,000 people displaced by the 2014 assault remain displaced or homeless. The blockade worsened after the military coup in Egypt that toppled the Muslim Brotherhood-led government of Mohammed Morsi and the clampdown on the Brotherhood and Hamas—a Brotherhood affiliate—by the military junta of Abdul Fattah el-Sisi. El-Sisi closed Egypt’s border crossing at Rafah and forced Hamas to close the tunnels between Gaza and Egypt that had provided a means of circumventing Israel’s blockade and a source of income, by taxing the goods brought in, for Hamas. Last year, Abbas imposed further hardship on Gaza. He stopped paying Israel for fuel for Gaza’s power station and electrical transmission into the Gaza Strip and ended or cut salary payments to thousands of public sector workers. This was to force Hamas into “reconciliation” talks with Fatah that culminated in a Cairo-brokered agreement in October. But the talks have stalled and the promised relief has failed to materialise. In October, the World Food Programme announced a cutback in its food voucher programme in Gaza due to a budget shortfall. Earlier this year, the Trump administration withheld $65 million in funding for the United Nations Relief and Work Agency (UNRWA), which supports some 1.2 million in Gaza, as well as $45 million in food aid in the West Bank and Gaza that it had promised for an emergency UNRWA appeal. UNRWA has for decades provided key social services as well as a vital lifeline for the poorest Palestinians. Now that too has gone and the viability of the agency itself is in question. Featured image is from Defend Democracy Press.